Faced with business growth challenges like disparate systems, manual business processes, and critical data stored in spreadsheets, small to midsized enterprise (SME) have many decisions to make when replacing a legacy business management system. Once you’ve narrowed down your top choices, the next question to ask is whether to buy from a software vendor or work with an ERP partner? The answer might not be clear as you think, here’s some advice to help you make an informed decision. It’s helpful to pare down your business management solution alternatives in the software selection phase to two or three options. Not only does this make for easier evaluation but also keep the project from becoming unwieldy and focused on the wrong criteria. If among your top picks you have included a small business accounting application like QuickBooks Enterprise to replace a small business accounting software, you’ll likely have to purchase direct from the software vendor or software publisher. One advantage here is that you have one relationship to manage. Meaning if something goes awry, you have one contact to speak with to address your needs. However, if your business is at a stage of business complexity and sophistication, where small business accounting software packages are preventing your business from achieving your goals for growth, you likely need a different category of business management solution. Enterprise resource planning software (ERP) is a complete solution for growing small businesses, that integrates all essential business functions for full operational visibility and better control over your business. In fact, as much as 80% of the businesses that partner with Vision33, began their business using QuickBooks as their business management solution preceding a period of rapid growth. After identifying business growth challenges, many SMEs will have identified the need for an integrated ERP solution to overcome their business challenges; this is where an ERP partner comes in. Because ERP is a category of robust business management solution, it sold by ERP partners that resell the solution but also provide services including consulting services such as business requirement specification, process mapping, ERP implementation, and customer support. This high level of comprehensive support is not available from off-the-shelf small business accounting software packages. When evaluating ERP solutions as part of your top choices for a new business management system, an implementation partner will sell the software licenses to your company but also provide experienced project managers, senior software developers, and implementation consultants to help coordinate and implement the solution. A good ERP partner ensures the alignment of technology with your business’ objectives for ERP once your business has outgrown the capabilities of small business accounting software. Working with an ERP partner has many advantages. A good ERP partner will have more local consultants available to your business – they are more likely to be regionally based. That means you get to deal face to face with people which is advantageous because you get more personalized attention. 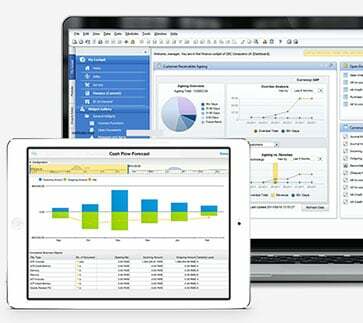 The other advantage is that ERP partners also offer solutions beyond their core ERP offering. Regardless of the vertical or micro-vertical markets you serve, you'll have a solution that provides functions based on your company’s processes and industry best practices. To learn more about ERP partner selection process, read the Vision33 ERP Selection Guide. The detailed steps and best practices found within are based on the experience of our expert team of business consultants and IT professionals. Through over 1,000 successful implementations, they’ve helped redesign growing businesses' processes to help them leverage transformative business technology and achieve their goals for growth.